Here are some examples of brake defects that could all have serious road safety implications. 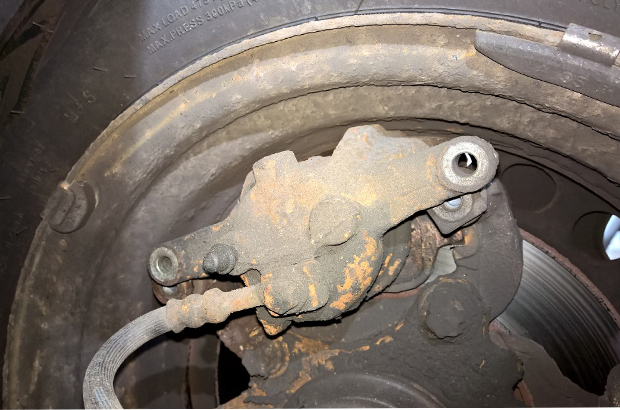 Gary of Autocare Services, Exeter, sent us this picture of a brake caliper on a Corsa. The car apparently had new brake pads fitted by a friend which had been in use for around 3 weeks. It looks like, after fitting the brake pads, their friend forgot to refit the caliper retaining bolts. Thankfully the caliper continued to provide some braking effect but you do wonder how the driver failed to notice something was wrong. 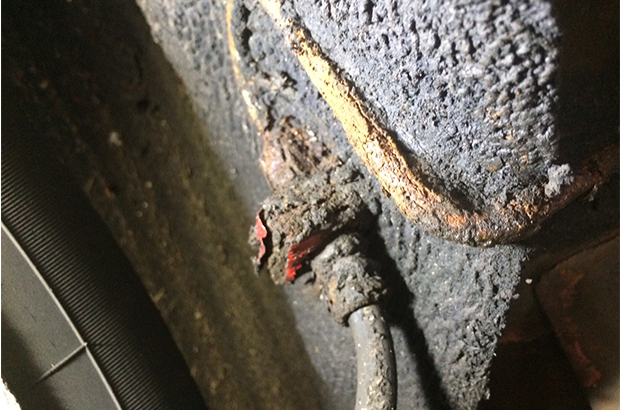 Here’s another DIY repair sent in by James from Fife. We don’t know why someone felt the need to cut the brake pipe, but they’ve clearly had more than one go at it. James says “excessively chafed doesn't cut it somehow”; maybe not, but it’s still an MOT failure. 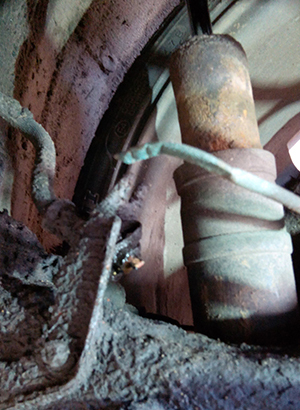 The MOT inspection manual isn’t written with this type of deliberate damage in mind but Reason for Rejection ‘A rigid brake pipe excessively chafed, corroded or damaged’’ would cover this. Finally a more common sight for testers that shows low mileage doesn’t guarantee that all is well. This picture of a 1998 Fiesta sent in by D & M Motors Ltd, Little Lever, had only 43,000 miles on the clock when presented for test. On inspection the rear brake pipes, including unions and brake hose ferrules, were heavily corroded and leaking fluid under pressure. It goes to show that the lack of regular maintenance can result in potentially dangerous defects just as much as badly carried out repairs. Thank you to everyone who’s been sending us horror stories. Please keep them coming. Have you got a horror story to tell? Send your photos to mattersoftesting@vosa.gov.uk. as a technician at Mercedes and a tester this is a concern for me, the rearmost part of the pipe (the 90 degree bend) is just visible with the covers on and worth a look as that is a known problem area. the leaking part of the pipe isnt visible at all when the covers are fitted, and very seldom the covers get removed. which begs the question of how many other cases of this are there? and is the mot inspection really enough to even say that a car is roadworthy at the time of test anymore? worrying. When entering test results for class 7 brake results, why is there an option for presented weight (like class 4) instead of just DGW. The manual says to put presented weight only for class 4. I think the video says it all. Paul. I always advise Engine covers, Under trays, Under covers and Cover sills. It's us that get the ear bashing if we miss something. It also protects us. one trouble is that its no longer on the Non component advisory notes Please dvsa reinstate this. Well I didn't test it before so have no idea but it failed when I saw it. see them like this all the time...........they sit on the soggy bit of carpet that Ford thought was a good idea as a splash shield! Always advise a pre - or post MOT "scratch and waxoyl"......carry out brake pressure tests at your peril if you see them like this as I have had them burst........and then "in theory" it's the testers fault for breaking the brakes by braking so hard! Well who said you can use a camera? There are brake pipes that cannot be seen eg over the top of fuel tanks, which I have had burst under pressure when doing brake roller tests, I started to use a camera after that, then got told off by the man from VOSA, so much for road safety! Surely it's only still a visual inspection as you're not stripping or removing anything? I use old door mirrors or dental mirrors to see into nooks and crannies like focus rear spring cups. Certainly with so many aerodynamic undertrays etc. Like Aircraft they should have inspection ports for endoscopes. They're not expensive anymore. you can only judge what you can see I guess ..Mercedes 211 rear pipes leading to flexies are one to look out for.. behind the wheel arch liner !! If the person has the correct quality control and is pulled on what they miss they can only get better but yes that should have been spotted before and the testor that has missed it should be removed from testing maybe they work at one of the many firms that push 30 minutes and 45 minutes test slots with no regard to the testor only profit. This goes to show that an annual assessment will no difference if testers can still miss things like this b/pipe. It must have been like that for years. have I missed something? where does it say the tester missed it??? Pete, the above comments are referring to previous tests I assume. Brake pipes don't Rot like that over a year is the point they are making. Si. With regards to the Fiesta brake pipe above - I was the tester who failed it and in fact the other side was similar. As I recall the older gentleman had been ill for some time and hadn't driven it for over a year I think and might have been parked up on a grass surface. The rear outer sills had rotted very badly and if you look at the pipe it is very rotten where it touches the sound carpet in the wheelarch. Ford infact cut out that section now if you look at the more modern Fiestas. So it's being kept damp continuously for a year without ever drying out - add to that if it was driven on a salted road prior to being parked it accelerates the process no end. SO it could have been a pass and advise last time it was MOT'd but certainly a fail at the time. Still doesn't get that bad in a year, or 2, I'd say it should've failed a few years ago. I've had Fiestas of that era fail on them 10 years ago! !